The film Formation of Shadows deals with the school for traditional hand shadow theater in Upper Nikozi in Georgia. Upper Nikozi is a village lying at the demarcation line to South Ossetia's biggest city Tskhinvali. The shadows of the conflict are still palpable there. In the course of a short residency of artasfoundation I had the opportunity to spend ten days in Upper Nikozi and collect some impressions. I got to know some people from the school for shadow theater and collaborated with them on some short experiments. The traditional form of shadow theater was made popular by Gela Kandelaki and his famous theater in Tbilisi, where he developed a technique by which the characters were formed only by the hands of the performers. Kandelaki founded and continues to supervise the class for hand shadow theater in Upper Nikozi. In a filmic interview with him in Tiflis and Upper Nikozi I not only delve into aesthetic questions of the shadow theater but also shed light on its context and content. The question I ask is as follows: What is hidden and what can be hidden and extracted from the play of shadows? The project creates a link between shadow theater and Georgian historiography by bringing into a filmic dialog the common state school in Upper Nikozi and the private art school. 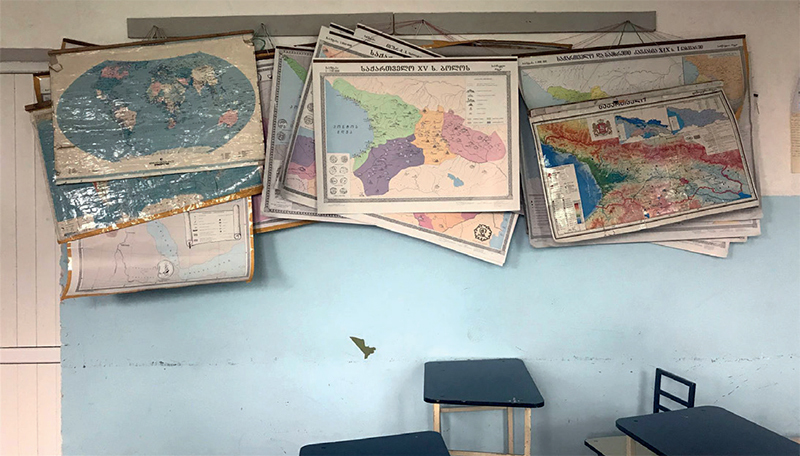 I ask a geography and a history teacher to explain a variety of maps in the classroom. This highlights how national "historical revisionism" functions in a post-socialist context. On the other hand, the project looks into what the shadows hide: stories and narratives from the periphery that do not lie in the floodlights of history. These stories stem from the local population of Upper Nikozi, whom I got to know during my stay. I have them retell these stories in front of the camera, both in the form of shadows and that of the "storyteller", like a boy performing slam poetry. During the final evening of my residency there was a stage for artistic performances of local performers/artists/slam poets. Even if they did not consider themselves as such, I saw great skills that I wanted to include in the film. In today's popular form of the shadow theater the stories are only told visually with a music soundtrack. There is no critical expression, leaving the art form mainly as entertainment. In filmic projects the stories are brought out of the shadows, confronting the viewer with personal stories and aesthetic beauty. Kamen Stoyanov, born in 1977 in Rousse, Bulgaria. He studied from 1996 to 2003 at the National Academy for Fine Arts in Sofia and from 2000 to 2005 at the Academy of Fine Arts in Vienna. He now lives and works in Vienna. Over the past years, his films, videos, actions, installations, photographic works and performances have been shown in numerous festivals and exhibitions.